Age-associated changes of T and NK cell (T/NK) potential of human hematopoietic stem cells are unknown. In this study, we enumerate and characterize T/NK precursors among CD34+Lin− cell populations circulating in normal human adult peripheral blood (PB) by a limiting-dilution assay using coculture with OP9-DL1 stroma cells expressing Notch 1 ligand, Delta–like 1. The frequency of T cell precursors in CD34+Lin− cells was found to decrease with donor age, whereas the ratio of NK to T cell precursor frequency (NK/T ratio) increased with age, suggesting that lymphoid differentiation potential of PB progenitors shifts from T to NK cell lineage with aging. Clonal analyses of CD34+Lin− cells showed that differences in the NK/T ratio were attributable to different distributions of single- and dual-lineage T/NK precursor clones. Because nearly all of the clones retained monocyte and/or granulocyte differentiation potentials in coculture with OP9-DL1 cells, T/NK precursors in PB are considered to be contained in the pool of T/NK/myeloid multipotent progenitors. The age-associated increase in NK over T cell commitment might occur in precursor cells with T/NK/myeloid potential. One of the most characteristic features of immunological aging is the decline of T cell production associated with thymic involution. Consequently, the peripheral naive T cell pool gradually reduces in size during aging. The main causes of age-associated thymic dysfunction are thought to involve impairments in both hematopoietic stem cells (HSCs) and thymic microenvironment (1–3). Studies in mice have shown the age-related loss of T cell potential in both prethymic and intrathymic progenitors (4, 5), and a recent report suggested that human HSCs exhibited myeloid-biased differentiation potentials with aging (6). Furthermore, a recent paper reported that T cell potential was lower in human adult bone marrow (BM) than cord blood (CB), suggesting high T cell potential in human neonate HSCs (7). However, precise age-associated changes in the T cell potential of human adult HSCs and downstream progenitors have not been well characterized. In contrast with age-associated decline in T cell development, both the proportion and absolute number of NK cells in the periphery have been reported to increase with age (8–10). These findings suggest that aging has either no effect or a positive effect on NK-lineage differentiation, which could lead to the observed increase in peripheral NK cells. The T/NK-lineage differentiation pathway is well defined, and it is widely accepted that both T and NK cells are generated from bipotent T/NK progenitors (11). We hypothesize that the bifurcation of T/NK coprogenitors shifts from T to NK cell lineage with aging, leading to the differences observed in T and NK cell numbers and proportions with aging. In addition to this, we hypothesize that the microenvironment supporting NK production may be unchanged or enhanced during aging in stark contrast to the decline of microenvironment for T cell development. To test the above hypotheses, we sought to establish in vitro functional and quantitative analyses of T and NK cell progenitors using peripheral blood (PB). Human PB was used as a source of progenitor cells because of the low availability of human tissue specimens and also because T/NK cell precursors are assumed to migrate from BM to the thymus through the bloodstream (12, 13). However, the entity of thymic immigrants for T/NK cell differentiation is rather controversial, although extensive studies have been conducted in mouse thymus, PB, and BM. Contrary to the classical model of hematopoiesis positing the earliest segregation of lymphoid and myeloid lineages, recent studies revealed that thymic immigrants possessed myeloid potential in addition to harboring T/NK cell potentials in mice (14–16). These results are concordant with previous findings that the only progenitors in blood with efficient T-lineage potential are multipotent progenitors (MPPs) with Lin−Sca1+ and c-Kit+ phenotypes including lymphoid-primed MPPs (LMPPs) and that no common lymphoid progenitors (CLPs) were detected in mouse blood (17). Contrasting reports have described a small number of CLPs in mouse blood that can produce T cell–lineage progeny in vitro and in the thymus (18–20). A more recent report revealed that lymphoid-restricted progenitors were the major route to T cell lineage in vivo despite their myeloid potential in vitro and that myeloid cells in the thymus originated from different precursors than T cells did under physiological conditions (21). Thus, as suggested in the previous studies, thymic progenitors in mice are thought to be multiple progenitor populations including CLPs and upstream LMPPs (12, 22). In humans, although recent work with BM and CB progenitors demonstrated the existence of analogous lymphoid progenitors with myeloid potential (23), lymphoid precursors circulating in adult PB have not been identified. In this study, we describe a cell sorting–based limiting-dilution assay (LDA) and clonal analyses for quantifying and characterizing T/NK progenitors among CD34+Lin− cell populations in the PB of healthy adult humans. We did not use any lymphoid progenitor-specific markers to isolate progenitors, because some mouse studies suggested that CLPs as well as more upstream progenitors with lymphoid potential can circulate in the blood, as mentioned above (17, 22). Because the CD34+Lin− cell population is believed to contain all classes of hematopoietic progenitors including myeloid progenitors, CLPs, LMPPs, MPPs, and HSCs (13, 23), we used selective culture conditions to analyze T/NK lineage. T cell differentiation can be induced in human CB CD34+ cells by coculture with OP9-DL1 stroma cells expressing the Notch 1 ligand Delta–like 1 and IL-7 and Flt-3 ligand (FL) (24). Activation of Notch 1 signaling also contributes to the efficient development of NK cells in humans (25, 26). It has recently been reported that Notch signaling in combination with IL-7, FL, and Kit ligand (KL), can induce NK-lineage differentiation in CB CD34+ cells in the absence of IL-15 (27). Thus, both T and NK cell differentiation can simultaneously be analyzed by the combination of OP9-DL1 coculture with those three cytokines. Using the assays, we examined age-associated changes of PB T/NK precursor frequencies in healthy adult humans. We found that the T cell precursor frequency significantly decreased with age, whereas NK cell precursor frequency did not. The findings suggest an age-associated shift of lymphoid differentiation potential from T to NK cell lineage in PB progenitors. Recombinant human KL, FL, IL-3, IL-7, and IL-15 were purchased from PeproTech. Erythropoietin was purchased from Invitrogen. Anti-CD3 (SK7), cytoplasmic CD3ε (cytCD3; UCHT1), CD4 (SK-3), CD5 (UCHT2), CD7 (M-T701), CD8 (SK1), CD16 (3G8), CD19 (HIB19), CD20 (2H7), glycophorin A (GA-R2), and IFN-γ (25723.11) Abs were purchased from BD Biosciences. Anti-CD16a (3G8), CD34 (581), CD56 (N901), and CD159a (Z199) Abs were purchased from Beckman Coulter. Anti-CD14 (TÜK4) and granzyme B (GB12) Abs were purchased from Invitrogen. Anti-CD161 (HP-3G1) Ab was purchased from eBioscience. Human PB samples were collected from 16 healthy in-house volunteer donors (Japanese) with informed consent, following the guidance of the institutional review board (Human Investigation Committee of Radiation Effects Research Foundation), which approved this study. PBMCs were separated from 10-ml PB samples by Ficoll density gradient centrifugation (Lymphocyte Separation Medium 1077; Wako Pure Chemical Industry). Normal BM mononuclear cells (BMMCs) (Caucasian) were purchased from Lonza Walkersville. Generation of the mouse OP9-DL1 stroma cells engineered to express the GFP and the mouse Delta-like 1 gene has been described previously (28). The OP9-DL1 and the OP9 (29) parental stroma cells were maintained by culturing in α-MEM (Life Technologies) supplemented with 20% FBS (Hyclone), 4 × 10−6 M 2-ME, and penicillin–streptomycin at 37°C in a humidified atmosphere flushed with 5% CO2. For progenitor cell culture, OP9-DL1 stroma cells were seeded in wells (50–80% confluence) precoated with 0.1% gelatin (Millipore) of a 384-well flat-bottom black plate (BD Biosciences). At least 4 h prior to progenitor cell sorting, culture medium in each well was replaced by 50 μl phenol red-free α-MEM containing 20% knockout serum replacement (Life Technologies), 10−4 M monothioglycerol (Sigma-Aldrich), 50 μg/ml gentamicin (Sigma-Aldrich), 10 ng/ml KL, 10 ng/ml FL, and 10 ng/ml IL-7 (T/NK medium). For progenitor cell sorting, PBMCs and BMMCs were stained with allophycocyanin-conjugated anti-CD34 Ab and PE-conjugated anti-lineage markers (anti-CD3, CD14, CD16, CD19, CD20, CD56, and glycophorin A Abs) for 30 min on ice, and dead cells were excluded by 1 μg/ml propidium iodide staining (BD Bioscience), as shown in Fig. 1A. One thousand CD34+Lin− cells were sorted into 80 wells of a 384-well plate at the frequency of 20, 15, 10, or 5 cells/well (20 wells for each cell frequency) by FACSAria II (BD Biosciences). Surrounding wells were filled with PBS containing antibiotics for reducing evaporation of culture medium. LDA culture was maintained at 37°C in a humidified atmosphere flushed with 5% CO2. One-half of culture medium (25 μl) was changed every week. After 5 wk of culture, all cells grown in wells were harvested by vigorous pipetting and washed with PBS containing 2 mM EDTA, 0.01% NaN3, and 1% FBS (washing buffer [WB]). For detection of T- and NK-lineage progenies by Cyan (Beckman Coulter), cells were stained with allophycocyanin-conjugated CD5, PE-conjugated CD7, and PE–Cy7-conjugated CD56 Abs in WB. Stained cells were resuspended with 200 μl WB containing 1 μg/ml DAPI (Invitrogen) to exclude dead cells by flow cytometry. OP9-DL1 cells and their cell debris were gated out using GFP fluorescence. CD7+CD5+ and CD7+CD56+ cells appeared in the constantly gated-fluorescence region were defined as T- and NK-lineage progenies, respectively. Absolute numbers of each progeny per well were calculated from the number of events on a flow cytogram in a volume (160 μl) of cell suspension. A well exhibiting six positive events and over was designated as a positive well. Frequencies of T and NK cell precursors were calculated by online analysis using ELDA software (30), available on the homepage of Walter Elisa Hall Institute Bioinformatics Division (http://bioinf.wehi.edu.au/software/elda/index.html). This software is based on a single-hit model and has a test of adequacy of the single-hit hypothesis and tests for frequency differences between multiple data sets. For differentiation kinetics and phenotype analyses, CD34+Lin− cells were cultured in some experiments at 500 cells/well using a 24-well plate in the same conditions as those used for the 384-well plates. CD34+Lin− cells from each donor were sorted (one cell per well) into a total of more than 560 wells using 384-well plates at a single cell per well. The culture conditions were the same as those for LDA, as described above. All cells in a well of a 384-well plate exhibiting generation of progenies after 5-wk culture were transferred to a well of a 96-well plate, where OP9-DL1 cells were preseeded. After culture for 5–10 d in the presence of KL, IL-7, and FL, cells were analyzed for T/NK-lineage markers, as described above. To determine the stage of T cell maturation, progeny cells were stained with PerCP-conjugated CD3, Pacific Blue–conjugated CD4, and allophycocyanin–Cy7-conjugated CD8 Abs in combination with CD5, CD7, and CD56 Abs. For characterization of NK-lineage progenies, cells were stained with PE-conjugated CD159a and PerCP–Cy5.5-conjugated CD161 Abs in combination with CD5, CD7, and CD56 Abs. Cytoplasmic expressions of granzyme B, CD3ε, and IFN-γ in NK-lineage progenies were analyzed by sorting cultured CD7+CD56+ cells. The cells were fixed and permeabilized using FACS permeabilizing solution (BD Biosciences) and stained with PE-conjugated anti-granzyme B, FITC-conjugated anti-CD3, or FITC-conjugated anti–IFN-γ Abs. Further maturation of CD7+CD56+ cells was induced by culture in T/NK-medium containing IL-15 (10 ng/ml) in the absence of stroma cells for 2–3 wk. Surface expressions of CD159a and CD161 and cytoplasmic expressions of granzyme B, CD3, and IFN-γ in the IL-15–induced cells were analyzed by the same procedures as described above. The presence of myeloid progenies in clonal cultures was determined by staining with PE-conjugated CD14 and PerCP-conjugated CD16 Abs for monocytes and granulocytes, respectively, in combination with CD5, CD7, and CD56 Abs. For morphological identification of myeloid lineage, clonal cells in wells exhibiting CD7+CD5+ and/or CD7+CD56+ progenies were pooled and stained with PE-conjugated CD7, allophycocyanin Alexa Fluor 750-conjugated CD14, and PerCP-Cy5.5 CD16 Abs. Either CD7−CD14+CD16− (monocytes) or CD7−CD14+CD16+ (granulocytes) cells were sorted into a droplet (25 μl PBS containing 2% BSA) on a glass slide and stained with May–Giemsa. CFU-GM and burst-forming unit erythroid were assayed by methylcellulose cultures, according to previously described methods (31). Briefly, PBMCs were plated in 24-well plates at a concentration of 2.5 × 105/ml in 0.25-ml culture containing 1.2% methylcellulose (Stem Cell Technology) with erythropoietin (6 U/ml), KL (20 ng/ml), G-CSF (20 ng/ml), and IL-3 (20 ng/ml). The methylcellulose cultures were counted after 14 d to determine the number of colonies per well. Spearman’s rank correlation analysis and Mann–Whitney U and χ2 tests were conducted using SPSS 16.01 software (SPSS). PB and BM CD34+Lin− cells (Fig. 1A) were cultured with OP9-DL1 stroma cells in the presence of KL, FL, and IL-7. Generation of T- and NK-lineage progeny in OP9-DL1 cultures was determined by flow cytometric detection of CD7+CD5+ and CD7+CD56+ progenies, respectively (Fig. 1B). Although variation among individual donors was large, the absolute numbers of both progenies per well on average were found to reach plateau levels after 5 wk of culture in both 24- and 384-well plates (Fig. 1 C–E). When we seeded 20 CD34+Lin− cells into wells of 384-well plates, we observed in approximately half of the wells the development of CD7+CD5+ or CD7+CD56+ cells, but the numbers of T/NK progenies could differ 100-fold from well to well (Fig. 1E). On the basis of the distribution of positive events in coculture of CD34+Lin− cells with OP9 control cells (Fig. 2A), we determined six positive events and over per well as the cutoff value for a positive well in LDA. Using this cutoff value, we confirmed that >95% of wells in the OP9 control culture were negative (240 wells examined for three volunteer donors in total). Although this cutoff value was somewhat arbitrary, regression curves of negative fractions for both T and NK cell precursors fit well with this model (Fig. 2B). Furthermore, this precursor frequency assay showed high reproducibility by a nonparametric correlation analysis between the first and second measurements (Supplemental Fig. 1). As a corollary, NK/T ratio was highly repeatable. The precursor frequencies in CD34+Lin− cells were converted to the percentages of precursors in CD34+Lin− population to assess the population size of progenitors with ease (Fig. 2B). Growth and differentiation kinetics of T/NK-lineage progenies generated from PB CD34+Lin− cells. (A) Representative flow cytograms of CD34+Lin− cells in PB (left panel) and BM (right panel) mononuclear cells. (B) Representative flow cytograms of CD5+CD7+ T-lineage (left panel) and CD7+CD56+ NK-lineage (middle panel) progenies generated from PB CD34+Lin− cells in 5-wk OP9-DL1 coculture in the presence of KL, IL-7, and FL. CD5 and CD56 were expressed in different cell populations of CD7+ cells (right panel). (C and D) Time courses of T- and NK-lineage differentiation of PB CD34+Lin− cells. PB CD34+Lin− cells from three donors were cultured at the concentration of 500 cells/well in a 24-well plate, where OP9-DL1 stroma cells were preseeded in the presence of KL, IL-7, and FL. Percentage (C) and absolute number (D) of CD7+CD5+ T- and CD7+CD56+ NK-lineage progenies generated from CD34+Lin− cells are plotted against time (weeks). Solid lines connect the average values. (E) Time course of T- and NK-lineage differentiation from CD34+Lin− cells from one donor. Each dot represents the total number of CD7+CD5+ (left panel) or CD7+CD56+ (right panel) cells generated from 20 CD34+Lin− cells in a well of 384-well plate. Twenty wells were analyzed for each of 3, 4, 5, and 6 wk. A well exhibiting six and greater positive events was determined to be a positive well for LDA. Similar results were obtained from two experiments for the other two donors. LDA for determination of T/NK precursor frequencies in PB CD34+Lin− cells by coculture with OP9-DL1 or OP9 control stroma cells. (A) CD34+Lin− cells in PB from one healthy donor were sorted into wells of a 384-well plate and cocultured with OP9-DL1 or OP9 control cells for 5 wk. Each dot represents the total number of CD7+CD5+ or CD7+CD56+ cells generated from twenty CD34+Lin− cells in a well, as shown in Fig. 1. (B) LDA for determination of T and NK cell precursor frequencies in CD34+Lin− cells by coculture with OP9-DL1 or OP9 control cells. One thousand PB CD34+Lin− cells from one donor were sorted into wells at the frequency of 20, 15, 10, or 5 cells/well (20 wells for each cell frequency) and cocultured with OP9-DL1 or OP9 control cells for 5 wk. Natural logs of negative-well fractions are plotted against the number of CD34+Lin− cells plated per well for T cell (upper panel) and NK cell (lower panel) precursors using ELDA software. Dotted lines represent 95% confidence intervals. p Values of likelihood ratio tests of a single-hit model were 0.50 and 0.47 for T cell and NK cell precursors, respectively. 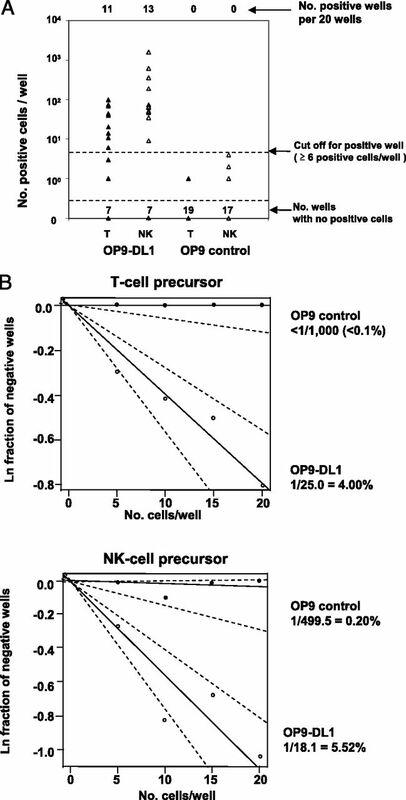 The differences of precursor frequencies between coculture with OP9-DL1 and OP9 control are highly significant for both T and NK cells (p = 4.7 × 10−9 and 2.3 × 10−8, respectively). The precursor frequencies are converted to the percentage in CD34+Lin− cells. Similar results were obtained from two experiments for the other two donors. CD7+CD5+ cells did not express CD3, CD4, and CD8 in ∼85% of positive wells (125 wells were analyzed in total from six volunteer donors) in LDAs from PB CD34+Lin− cells (Supplemental Fig. 2). Only 6% of the positive wells expressed both CD4 and CD8 but remained surface CD3 negative. Nevertheless, because nearly all CD7+CD5+ cells produced cytCD3, these cells were certainly committed to the T cell lineage. The majority of CD7+CD56+ cells generated in LDAs of PB CD34+Lin− cells expressed CD161 (NK receptor) but not CD16, CD159a (NKG2A), granzyme B, or cytCD3 (Fig. 3A, 3B). Further culture with IL-15 in the absence of stroma cells induced expressions of CD159a, granzyme B, and cytCD3 in CD7+CD56+ NK cell progenies (Fig. 3B). Those findings indicate that CD7+CD56+ progenies generated in OP9-DL1 coculture were immature NK cells. Moreover, the presence of IL-15 from the beginning of OP9-DL1 coculture induced expressions of CD159a, granzyme B, IFN-γ, and cytCD3 but partially inhibited T cell development (Supplemental Fig. 3). We also found by LDA that, in the absence of Notch 1 signaling, IL-15 could induce CD7+CD56+ cells significantly but less effectively than in the presence of Notch 1 signaling (Supplemental Fig. 3). Characterization of CD7+CD56+ cells generated from CD34+Lin− cells. 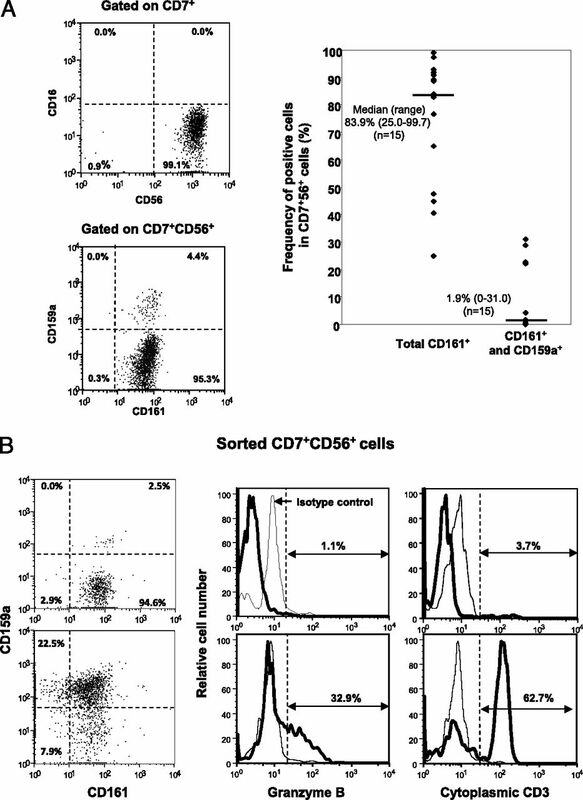 (A) Representative flow cytograms of CD16 and CD56 expressions in CD7+-gated cells (upper panel) and CD161 (NK receptor) and CD159a (NKG2A) expressions in CD7+CD56+-gated cells (lower panel) generated from 20 CD34+Lin− cells in a well of 384-well plate after 5 wk of culture (left panel), and frequencies of total CD161-positive cells and CD161/CD159a double-positive cells (mature phenotype) in CD7+CD56+ cells from 15 wells showing six CD7+CD56+ events and over (right panel). Bars in the graph represent medians of the frequencies. (B) Induction of CD159a, granzyme B, and cytCD3 in CD7+CD56+ progenies by further culture with IL-15. No significant or very low expressions of these mature NK phenotypes were observed in CD7+CD56+ cells sorted from 5-wk mass culture of CD34+Lin− cells with OP9-DL1 cells (upper panels). Significant expressions of those phenotypes were detected in CD7+CD56+ cells after 3-wk culture with IL-15 (10 ng/ml) in the absence of stroma cells (lower panels). We obtained the frequencies of T/NK precursors in CD34+Lin− cells from PB (n = 20) and BM (n = 3) (Table I). Both frequencies of T and NK cell precursors in PB CD34+Lin− cells ranged approximately from 1 to 7% among 20 healthy donors. No significant difference between PB and BM was observed for both frequencies of T and NK cell precursors (p = 0.27 and p = 0.16 in Mann–Whitney U test, respectively), although this may be due to the small number of BM samples. Associations of T and NK cell precursor frequencies in PB with age were analyzed for the 20 donors (Fig. 4). The frequency of T cell precursors was found to significantly decrease with age (Spearman’s rank correlation; p = 0.0005), but no significant association of NK cell precursor frequency with age was detected (p = 0.50). Consequently, the NK/T ratio significantly increased with age (p = 0.002). Association of T and NK cell precursor frequencies in PB CD34+Lin− cells with donor age. Frequencies of T (upper panel) and NK cell (middle panel) precursors in PB from 20 donors (10 females, ○; 10 males, ●) as shown are plotted against age. Ratio of NK to T precursor frequency (NK/T ratio) is also plotted on a log scale (lower panel). Spearman’s rank correlation coefficients (ρ) are shown with p values. In addition, the proportion of CFU-GM (total proportion of CFU-G, -M, and -GMmix) in PB CD34+Lin− cells in the 20 donors ranged from 3.0 to 19.4% (median, 11.2%), which did not show significant age-association (Spearman’s rank correlation; p = 0.92). Similarly, no significant association with age (p = 0.26) was observed for the proportion of burst-forming unit erythroid in PB CD34+Lin− cells (median, 29.6%; range, 11.1–53.6%). The CD34+Lin− cell proportion (median, 0.066%; range, 0.015–0.150%) in PBMCs showed no significant decline with age (p = 0.68). To examine whether the difference in NK/T ratio among donors might be attributed to the difference in relative prevalence of T/NK dual- and T or NK single-lineage precursors, we performed clonal analyses of progenies generated from single PB CD34+Lin− cells for the two donor groups with high and low NK/T ratios (Table II). In this analysis, precursors were classified to T/NK dual-, T single-, and NK single-lineage precursors by the surface phenotype of their progenies (Fig. 5A), including precursors producing small numbers of progenies (six events and more per well) (Supplemental Fig. 4). In the low NK/T ratio donor group, the majority of progenies were generated from T/NK dual-lineage precursors, and the rest of the progenies were derived from T or NK single-lineage precursors (Table II). In contrast, the majority of progenies from the high NK/T ratio group were found to be derived from NK single-lineage precursor clones. The relative prevalence of the T/NK precursor clones significantly differed between the low and high NK/T ratio groups (χ2 test; p < 10−6). T/NK- and myeloid-lineage progenies derived from a single PB CD34+Lin− cell. PB CD34+Lin− cells from each donor were sorted into more than 560 wells of 384-well plates at the frequency of one cell per well. After 5-wk culture, wells exhibiting cell growth were analyzed for the surface phenotypes of T/NK and myeloid lineages. (A) Representative flow cytograms of CD5 and CD56 expressions in CD7+-gated progenies from a single CD34+Lin− cell. Each precursor was classified to T/NK dual-lineage (left panel), T single-lineage (middle panel), and NK single-lineage (right panel). (B) Myeloid cell progenies generated from a single CD34+Lin− cell which simultaneously produced T- and/or NK-lineage cells. Representative flow cytograms of CD7−CD14+ (left panel) and CD7−CD16+ (middle panel) myeloid cells generated from a precursor that produces both of T and NK dual-lineage progenies as shown in (A). CD16+ cells expressed a low level of CD14 (right panel). Similar results were obtained for T single- and NK single-lineage precursor clones. (C) May-Giemsa staining confirmed that CD7−CD14+CD16− cells (left panel) and CD7−CD14+CD16+ cells (right panel) were monocytic and granulocytic, respectively. Scale bars, 10 μm. Images were acquired by BIOREVO model BZ-9000 (Keyence) with Plan Apo ×40/0.95 numerical aperture objective lens (Nikon) using BZ-II Viewer and BZ-II Analyzer software. 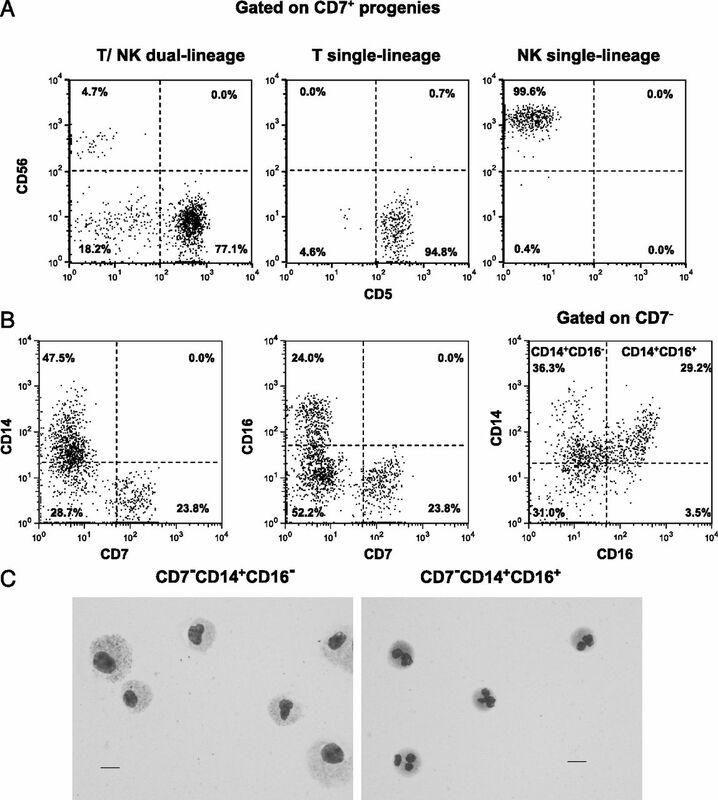 Surprisingly, ∼98% of the T/NK precursor clones examined (n = 109) simultaneously generated CD7−CD14+CD16− and/or CD7−CD14+CD16+ myeloid cells in the cultures (Fig. 5B, Table III). The tested clones included T/NK dual-, T single-, and NK single-lineage precursors (n = 33, 14, and 62, respectively). May–Giemsa staining confirmed that CD7−CD14+CD16− or CD7−CD14+CD16+ cells were monocytic or granulocytic, respectively (Fig. 5C). Therefore, we conclude that the majority of T/NK precursors in adult PB can retain myeloid differentiation potential. The presence of HSCs in human PB was demonstrated previously by autologous transplantation of PB WBCs (32). However, characterization of circulating HSCs in steady state has been hampered mainly because of their rarity. Although G-CSF can mobilize PB HSCs, it is not known whether the functional properties of such mobilized PB HSCs are the same as those of nonmobilized PB HSCs. In this study, we have developed novel assays for the functional enumeration and characterization of rare PB T/NK precursors using cell sorting–based limiting-dilution and clonal analyses. Microculture using a 384-well plate with a small observation field and small volumes of culture medium made it easy to observe cell growth under the microscope and to maintain a small number of progenitors ex vivo. This assay can be used to measure the T/NK precursor frequencies in PB CD34+Lin− cells expanded on OP9-DL1 layers in the presence of KL, IL-7, and FL. Our results showed that the proportions of T and NK cell progenitors in PB CD34+Lin− cells were not significantly different from those in BM CD34+Lin− cells. The results suggest that the proportional compositions of T/NK progenitor populations in PB may be comparable with those in BM, although the mechanism for export of progenitors to PB from BM in steady state is unknown. Our findings indicate that Notch signaling is required for both T- and NK-lineage commitment of human PB progenitors in culture. Because the majority of CD7+CD5+ progenies generated in coculture with OP9-DL1 cells were found to express cytCD3 but have a triple-negative phenotype, the T cell maturation from adult PB progenitors cannot proceed further under the present culture condition. This result may not be concordant with previous reports describing full T cell maturation of human CB CD34+ cells in OP9-DL1 coculture (24). Full maturation from adult PB progenitors may require longer periods of coculture or thymic environments (33, 34). Our observation that in vitro NK cell differentiation from PB progenitors requires Notch 1 signaling is concordant with previous studies describing development of mouse BM and human CB NK progenitor cells (25, 27, 35, 36). However, a recent study using knockout mice described that Notch 1 deficiency completely abrogated early thymic progenitors and subsequent T cell development but did not affect thymic NK cell development at all (37). Thus, the role of Notch1 signaling in mouse NK cell development is dispensable in vivo, but its role for in vivo human NK cell commitment remains unknown. Furthermore, in the current study, IL-15 induced the expression of molecules associated with NK cells such as cytCD3, granzyme B, and CD159a in the CD7+CD56+ cells generated from the OP9-DL1 coculture. The essential role of IL-15 in NK cell development is well accepted in both mice and humans (38, 39). Our observation is consistent with previous reports describing IL-15 augmentation of Notch activation–induced NK cell differentiation from CB CD34+ cells (26, 27). It also was found that IL-15 could partially but significantly induce CD7+CD56+ cells in the absence of Notch 1 signaling. Taken together, our data suggest that both Notch 1 and IL-15 signaling are involved in the induction of NK cell commitment of human PB progenitors in vitro and that IL-15 but not Notch 1 is essential for further maturation of the NK-committed cells (CD7+56+ cells). If that is the case, the role of Notch 1 in NK cell development may be dispensable in humans in vivo. In the current study, the frequency of T cell precursors derived in vitro from PB CD34+Lin− cells significantly decreased with age, but the NK cell precursor frequency did not significantly change. Age-related increases in mature NK cells in the periphery are associated with an increase in the NK subset dimly expressing CD56 (CD56dim), whereas CD56high NK cells remain stable with age (8, 9, 40). The majority of NK-lineage progenies from PB progenitor express high levels of CD56 but not CD16, as shown in the current study. The CD56highCD16− NK subset found in the periphery is thought to originate in the thymus and is functionally different from CD56dimCD16+ NK subset (41); therefore, the majority of NK-lineage progenies generated from PB progenitors may be thymic-derived NK cells. If that is the case, the results showing no age-associated changes in NK precursor frequency is in accordance with the insignificant changes of the CD56high NK subset with aging, as mentioned above. Clonal analyses of PB CD34+Lin− cells showed that many progenitor clones were able to produce both T and NK progenies. Because the LDA did not discriminate single- and dual-lineage precursors, precursor frequencies obtained from the LDA are considered to simply reflect the total number of events of lineage commitment in the CD34+Lin− progenitor population. Clonal analyses also demonstrated that the distributions of single- and dual-lineage T/NK precursor clones significantly differed between the donors whose NK/T ratios were high and low. Therefore, the difference of NK/T ratio among donors was attributable to the difference in relative prevalence of single-and dual-lineage T/NK precursor clones. Particularly, high proportions of NK single-lineage precursors were observed in donors with high NK/T ratios, suggesting that high NK/T ratios in aged donors are the result of an increase in NK single-lineage progenitors. This indicates that the age-associated shift of T/NK differentiation can be explained by changes of lineage commitment at T/NK bifurcation point in each progenitor cell. It is noteworthy that the relative prevalence of NK single-lineage precursor clones in CB CD34+Lin− cell populations was very low (0.8% of total single-and dual-lineage T/NK-precursor clones), which is in strong contrast to the adult PB (S. Kyoizumi, Y. Kubo, J. Kajimura, K. Yoshida, T. Hayashi, K. Nakachi, L. F. Young, M.A. Moore, M.R.M. van den Brink, and Y. Kusunoki, manuscript in preparation). Therefore, our results support our hypothesis that bifurcation of T/NK coprogenitors shifts from T to NK cell lineage with aging. We observed that generation of T- and/or NK-lineage progenies from progenitor clones was associated with myeloid differentiation. That finding indicates that the pool of T/NK cell precursors in human PB is constituted by T/NK/myeloid common progenitors. Recent work with human BM and CB cells also established the existence of lymphoid progenitors with myeloid potential (23). Our results are concordant with previous observations in adult mice that the progenitors in blood with efficient T-lineage potential were CLP (20) and LMPP (17) and that thymic immigrants retain myeloid potential (14–16), although the myeloid potential may not manifest under physiological conditions, as reported by other researchers (20, 21, 42, 43). However, because we did not examine the differentiation potentials of the progenitor clones to other lineages such as B cell, erythrocyte, and megakaryocyte lineages, it is unknown whether these clones were CLP, LMPP, MPP, or HSC, all of which can display combined lymphoid and granulocyte–monocyte potentials in vitro. Because nearly all of the progenitor clones generating either T or NK single-lineage progenies produced myeloid cells, these clones may bifurcate into T or NK cells after or concurrently with dichotomy of T/NK and myeloid lineages in culture. If that is the case, an age-associated shift to NK-lineage commitment is considered to be primed in progenitors at the stage of CLP, LMPP, or a more upstream stage. We assume that this priming of T/NK bifurcation occurs in HSCs, because such age-associated changes should be accumulated in long-lived and self-renewing stem cells but not in CLP, LMPP, or MPP with transient life spans. It can be presumed that aging might affect the expression levels of genes regulating T/NK-lineage commitment (11). Age-associated epigenetic changes in such genes of HSCs may imprint the biased lineage commitment at a tail branch of the differentiation tree (44). T/NK–differentiation potential altered because of the age of PB donors may contribute to an age-associated shift of the human immune system from acquired to innate immunity. Extensive evidence indicated that the HSC number in BM increased substantially with age in mice (45, 46). However, HSCs from old mice showed functional deficiencies, including diminished repopulating ability and a biased lineage potential from lymphopoiesis toward myelopoiesis (44, 47–50). In humans, a recent study also found that aged immunophenotypic HSCs increased in frequency and exhibited myeloid-biased differentiation potential compared with young HSCs (6). Our findings of PB myeloid–committed progenitors also support that myeloid potential does not decrease with age in contrast to T cell potential, although it is unknown whether human LMPP contributes to myelopoiesis under physiological conditions. In conclusion, we have developed a novel assay to assess T/NK potential of PB HSCs and demonstrated an age-associated increase of NK over T cell development for PB HSCs. We thank M. Yamaoka for excellent assistance with the FACS analyses and E. Douple for critical review of the manuscript. This work was supported by the Radiation Effects Research Foundation (Hiroshima and Nagasaki, Japan), a private, nonprofit foundation funded by the Japanese Ministry of Health, Labor, and Welfare and the U.S. Department of Energy, the latter in part through Department of Energy Award DE-HS0000031 to the National Academy of Sciences. This study was based on Radiation Effects Research Foundation Research Protocol RP 5-09 and was supported by the U.S. National Institute of Allergy and Infectious Diseases (Contract HHSN272200900059C). The views of the authors do not necessarily reflect those of the two governments. 2010. Thymic fatness and approaches to enhance thymopoietic fitness in aging. Curr. Opin. Immunol. 22: 521–528.
. 2009. Thymic involution and immune reconstitution. Trends Immunol. 30: 366–373.
. 2005. Aging and T cell development: interplay between progenitors and their environment. Semin. Immunol. 17: 337–346.
. 2004. Reduction in the developmental potential of intrathymic T cell progenitors with age. J. Immunol. 173: 245–250.
. 2007. Multiple prethymic defects underlie age-related loss of T progenitor competence. Blood 110: 1161–1167.
. 2011. Human bone marrow hematopoietic stem cells are increased in frequency and myeloid-biased with age. Proc. Natl. Acad. Sci. USA 108: 20012–20017.
. 2011. T-lymphoid differentiation potential measured in vitro is higher in CD34+CD38-/lo hematopoietic stem cells from umbilical cord blood than from bone marrow and is an intrinsic property of the cells. Haematologica 96: 646–654.
. 1998. Flow cytometry measurements of subsets of T, B and NK cells in peripheral blood lymphocytes of atomic bomb survivors. Radiat. Res. 150: 227–236.
. 2009. Human innate immunosenescence: causes and consequences for immunity in old age. Trends Immunol. 30: 325–333.
. 1993. Lymphocyte subsets and natural killer cell activity in healthy old people and centenarians. Blood 82: 2767–2773.
. 2010. The intrathymic crossroads of T and NK cell differentiation. Immunol. Rev. 238: 126–137.
. 2011. Hematopoietic progenitor migration to the adult thymus. Ann. N. Y. Acad. Sci. 1217: 122–138.
. 2013. Early T-cell progenitors are the major granulocyte precursors in the adult mouse thymus. Blood 121: 64–71.
. 2004. Circulating hematopoietic progenitors with T lineage potential. Nat. Immunol. 5: 953–960.
. 2006. Primitive lymphoid progenitors in bone marrow with T lineage reconstituting potential. J. Immunol. 177: 2880–2887.
. 2009. Reductive isolation from bone marrow and blood implicates common lymphoid progenitors as the major source of thymopoiesis. Blood 113: 807–815.
. 2010. Multiple extrathymic precursors contribute to T-cell development with different kinetics. Blood 115: 1137–1144.
. 2010. Revised map of the human progenitor hierarchy shows the origin of macrophages and dendritic cells in early lymphoid development. Nat. Immunol. 11: 585–593.
. 2005. Induction of T-cell development from human cord blood hematopoietic stem cells by Δ-like 1 in vitro. Blood 105: 1431–1439.
. 2007. Notch signaling induces cytoplasmic CD3ε expression in human differentiating NK cells. Blood 110: 2696–2703.
. 2001. Differential effects of Notch ligands Δ-1 and Jagged-1 in human lymphoid differentiation. J. Exp. Med. 194: 991–1002.
. 2009. Notch activation induces the generation of functional NK cells from human cord blood CD34-positive cells devoid of IL-15. J. Immunol. 182: 6168–6178.
. 2002. Induction of T cell development from hematopoietic progenitor cells by Δ-like-1 in vitro. Immunity 17: 749–756.
. 1994. Involvement of the c-kit receptor in the adhesion of hematopoietic stem cells to stromal cells. Exp. Hematol. 22: 979–984.
. 2009. ELDA: extreme limiting dilution analysis for comparing depleted and enriched populations in stem cell and other assays. J. Immunol. Methods 347: 70–78.
. 1992. Implantation and maintenance of functional human bone marrow in SCID-hu mice. Blood 79: 1704–1711.
. 1986. Autologous transplantation of blood-derived hemopoietic stem cells after myeloablative therapy in a patient with Burkitt’s lymphoma. Blood 67: 529–532.
. 2009. Characterization in vitro and engraftment potential in vivo of human progenitor T cells generated from hematopoietic stem cells. Blood 114: 972–982.
. 2010. In vitro-differentiated T/natural killer-cell progenitors derived from human CD34+ cells mature in the thymus. Blood 115: 261–264.
. 2006. The potential involvement of Notch signaling in NK cell development. Immunol. Lett. 107: 50–57.
. 2006. Transient Notch signaling induces NK cell potential in Pax5-deficient pro-B cells. Eur. J. Immunol. 36: 3294–3304.
. 2010. Cutting edge: thymic NK cells develop independently from T cell precursors. J. Immunol. 185: 4993–4997.
. 1999. The multifaceted regulation of interleukin-15 expression and the role of this cytokine in NK cell differentiation and host response to intracellular pathogens. Annu. Rev. Immunol. 17: 19–49.
. 1998. Natural killer cell differentiation: insights from knockout and transgenic mouse models and in vitro systems. Immunol. Rev. 165: 47–61.
. 1999. 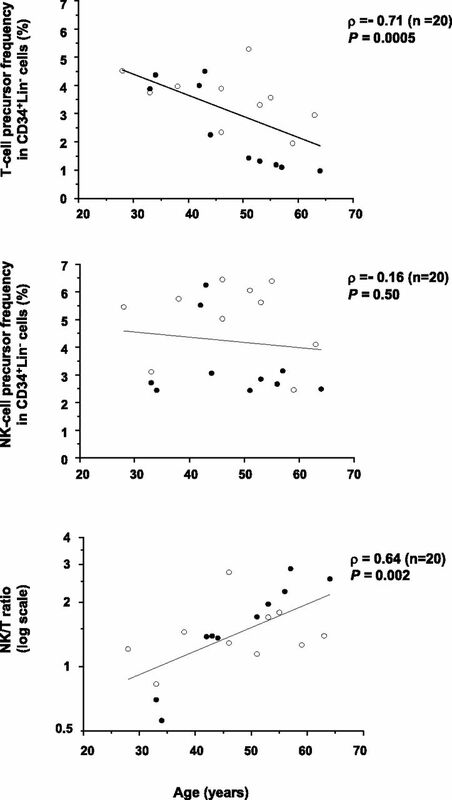 NK phenotypic markers and IL2 response in NK cells from elderly people. Exp. Gerontol. 34: 253–265.
. 2007. Developmental pathways that generate natural-killer-cell diversity in mice and humans. Nat. Rev. Immunol. 7: 703–714.
. 2000. Clonal characterization of a bipotent T cell and NK cell progenitor in the mouse fetal thymus. J. Immunol. 164: 1730–1733.
. 2011. In vitro assays misrepresent in vivo lineage potentials of murine lymphoid progenitors. Blood 117: 2618–2624.
. 2007. Aging hematopoietic stem cells decline in function and exhibit epigenetic dysregulation. PLoS Biol. 5: e201.
. 2007. Age-dependent increase in side population distribution within hematopoiesis: implications for our understanding of the mechanism of aging. Stem Cells 25: 828–835.
. 1996. The aging of hematopoietic stem cells. Nat. Med. 2: 1011–1016.
. 2005. Cell intrinsic alterations underlie hematopoietic stem cell aging. Proc. Natl. Acad. Sci. USA 102: 9194–9199.
. 2004. Myeloid-biased hematopoietic stem cells have extensive self-renewal capacity but generate diminished lymphoid progeny with impaired IL-7 responsiveness. Blood 103: 4111–4118.
. 2000. Age-associated characteristics of murine hematopoietic stem cells. J. Exp. Med. 192: 1273–1280.
. 2003. Major age-related changes of mouse hematopoietic stem/progenitor cells. Ann. N. Y. Acad. Sci. 996: 195–208.